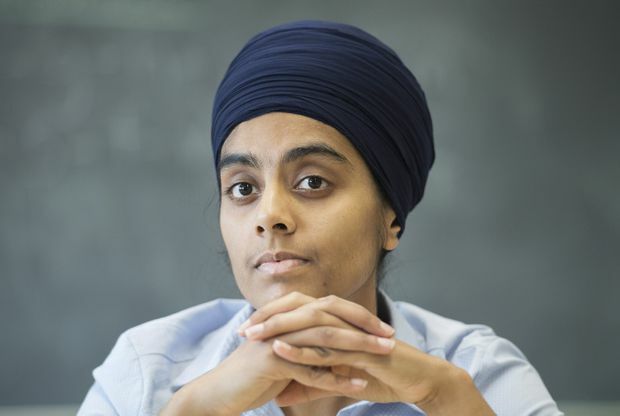 Kaur, a Sikh woman working on a Bachelor of Education degree, is one of many Quebecers who could see her career choices limited if the province’s newly elected government goes through with a promise to ban certain state employees from wearing religious symbols in the workplace. For Kaur at least, taking off her turban isn’t an option. Amrit Kaur at a school in Vaudreuil-Dorion, Que., on Friday. “I can’t dissociate myself from it, because it’s a part of me,” she said. And she feels that accepting a desk job – an option proposed by Legault’s Coalition Avenir Quebec – would be a disservice not only to herself but to her students, who come from diverse backgrounds and need to see that diversity reflected in the front of their classrooms. “You’re supposed to have those discussions about inclusivity, that we’re all different, we all have special characteristics,” Kaur said in a phone interview from Ottawa, where she’s completing her degree. Like Kaur, Namarta Malhi believes politicians are trying to create a problem where none exists. Both say they’ve grown up in the province, learned French, and have always felt like they belonged in Quebec society. “There has never been a case, to my knowledge, when an authority figure is not performing a task properly because they have this thing on their head, because they’re covering their hair,” said Malhi, a 20-year-old student. As a baptized Sikh woman, Malhi said wearing her turban was her own choice. To her, it is an article of faith and a symbol that she is equal to her male counterparts. She said she understands that the province’s history, which included Catholic control over schools and other institutions, has caused some Quebecers to fear any sign of religion in public life. But she said she also can’t accept that the articles of her faith, which include a turban and a kirpan, or sword, could prevent her from pursuing a career in law or government. The Coalition Avenir Quebec swept to power in last week’s provincial election, winning 74 of the province’s 125 ridings. One day later, the Coalition leader said he would invoke the notwithstanding clause if necessary to override the Charter of Rights and Freedoms and ensure public officials in positions of authority don’t wear religious symbols, including turbans, hijabs, crosses and Jewish kippahs. Montreal teacher Furheen Ahmed, who wears a hijab, said she has faith the measure will fall through, as did the Parti Quebecois’ 2013 proposed Charter of Values. But if it doesn’t, the Westmount High School English, history and geography teacher said she’d fight for her rights and those of her colleagues, although she’s not yet sure what form that action will take. Rob Green, a fellow teacher from the school, said many of Ahmed’s colleagues will be fighting right there with her. In the past, he said teachers have held demonstrations, created viral videos and donned religious symbols en masse as a form of support. “If they dare come into our school and try to remove teachers or give us desk jobs, we will make a public spectacle of this and do as much political damage to the government as we possibly can,” he said in a phone interview. Malhi, Kaur and Ahmed all said they don’t believe Legault’s claim that there’s a “broad consensus” that such a measure is necessary, pointing to surveys that show identity issues are low on most people’s priority lists. And they all have a similar request for Legault: they want him to look in their classrooms, and open a dialogue with the communities his policies will affect. “I’d invite them in my classroom and say, come look at what goes on in my classroom and what we’re learning and discussing, and see for yourself if it’s not neutral because I’m wearing something on my head,” Ahmed said.